LEGO® KidsFest Indianapolis and a GIVEAWAY! | Back Home Again: LEGO® KidsFest Indianapolis and a GIVEAWAY! I was given 4 tickets to attend the opening night of LEGO® KidsFest Indianapolis as well as 2 tickets to use in a give-away. However, I was not influenced by the promotional materials. All opinions are my own. We attended LEGO® KidsFest in Louisville in 2013 and it was seriously awesome! While Ewan loved it and had a blast, I think Alan and I had more fun that he did. We are all so so excited to attend in Indianapolis this year! 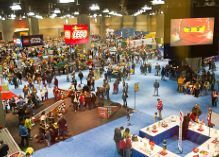 If you don't know what LEGO KidsFest is, it's a giant traveling LEGO expo that's coming to the Indianapolis Convention Center from Nov. 7 - 9, 2014. 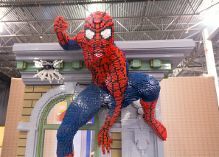 There are millions of LEGO bricks, which include construction zones, dozens of life-sized LEGO models and displays, LEGO Friends, LEGO Chima, LEGO Star Wars, live LEGO Master Builders that covers three acres of space. Tickets sell out crazy fast so I encourage you to purchase yours online soon if you plan on going. Guess what? I'm giving away two tickets to attend the opening session of LEGO® KidsFest in Indianapolis on November 7, 2014 from 4-8:30PM! Enter here to win. 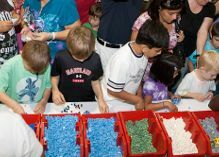 I encourage you to LIKE and Follow LEGOKidsFest on Facebook, Twitter and/or Instagram for all the latest ticketing updates as this event has been selling out in prior cities. Must be 18 to enter, 1 entry per day allowed, random drawing by USFG!